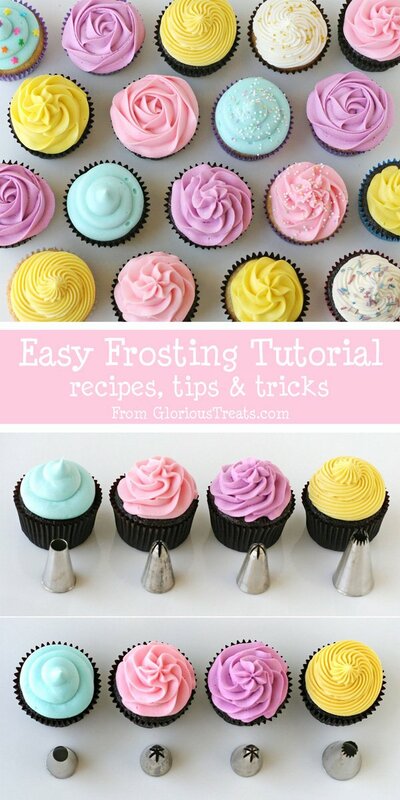 One topic that I often receive questions on, is how to frost cupcakes. I’ve been wanting to post on this topic for some time, but wanted to do a nice complete post, something that would be a nice reference for you to come back to. I hope this post will be a good resource for you. I remember when I first started decorating cupcakes I too was very interested in (and intimidated by) creating a beautiful swirl on cupcakes. After doing it only a few time I found that filling a piping bag and adding a nice swirl of frosting on cupcakes is actually much easier and quicker than spreading frosting! In order for the frosting to have enough body (be thick enough) to hold up, you need a good frosting to start with. Make sure not to add to much liquid, or allow your ingredients to be too warm. I would not recommend using canned (pre-made) frosting to pipe on cupcakes, it’s usually not firm enough to hold up. I have heard of people adding powdered sugar to canned frosting to thicken it… but if you are going to do that, it’s just as easy to make it yourself. I’ve posted recipes for American Buttercream, and Cream Cheese Frosting, the two frostings I use most of the time. 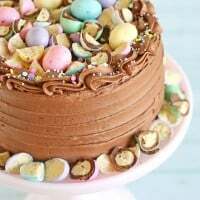 Swiss Meringue Buttercream (explained beautifully by Rosie of Sweetapolita) also makes a beautiful frosting for piping. 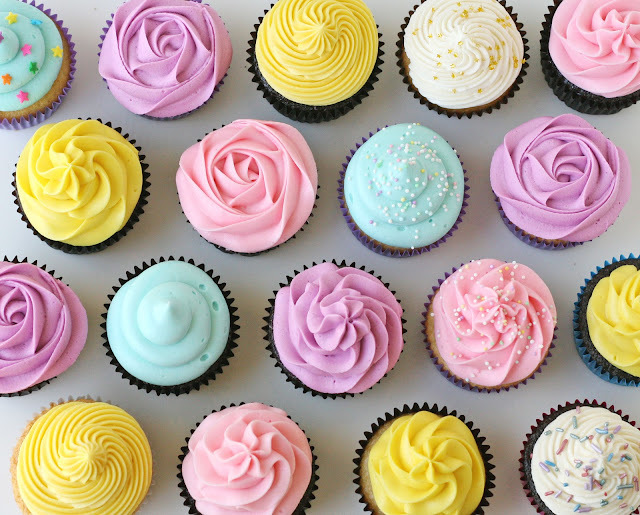 To frost cupcakes, you’ll want to use a large (sometimes called jumbo) decorating tip. The four most common shapes (openings) are shown above. The Wilton 1M and 2D are often available at craft stores, the others you may have to buy on-line. I like to use a coupler to hold my tips in place, for these large tips you’ll need a large coupler as well. Large tips can also be used without a coupler, by simply setting the tip inside the bag, then filling with frosting. And for a grand finale… my first ever video! Simple and to the point, but I think it’s sometimes helpful to just see something done from start to finish. Enjoy! P.S. No, my counters are not dirty, yes the grout is brown… that is the color of the grout. My kitchen (and counters) are original to my house, which was built in 1958. They’re old. Have fun experimenting with different tips and frostings. Use concentrated gel coloring to color your frosting (like Americolor or Wilton). Add some sprinkles, and you’ve got a beautiful and delicious treat! hi which nozzle are you using on your video and where could I buy it from? 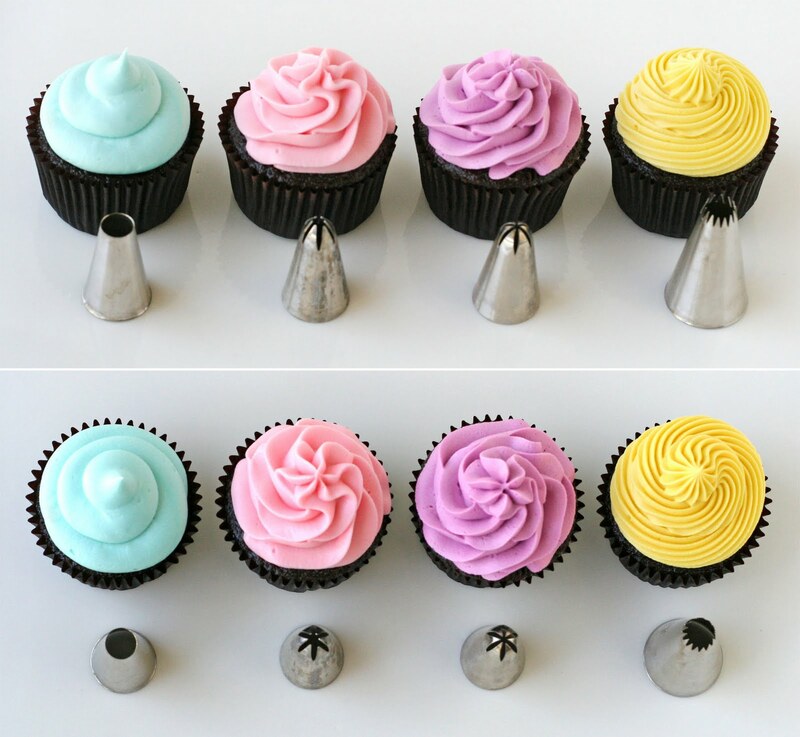 I’ve been so intimidated by frosting cupcakes, but you make it look so easy! I’m excited to go try the rose design Thanks for the video – the visual really helps! Oh, I’m so bad at piping frosting! I’m definitely saving this one for the next party. Thanks! I have the 1M and the 2D but what are the other two tip numbers. My granddaughter love watching the video….we have watched it over and over and over!! Thank you for this! Super helpful! Great post! i really love to visit here,such a wonderful site,Thanks for visiting. 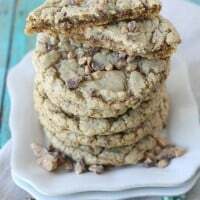 I’ve been using your recipes and techniques for every birthday since I first found them a few years ago. I just wanted to say THANK YOU!!! I really appreciate you sharing your hard work and talent!! A good frosting guide for cupcake bakes. Really great. Soy de Perù.Que maravilla!!! !,me encantò su pàginay todo lo que hacen.Muchas gracias por compartir y muy bien explicado. Por favor me podrias enviar a mi email:flordchocolate@yahoo.com la receta del frosting de los cupcakes.Gracias de antemano. You are an artist! 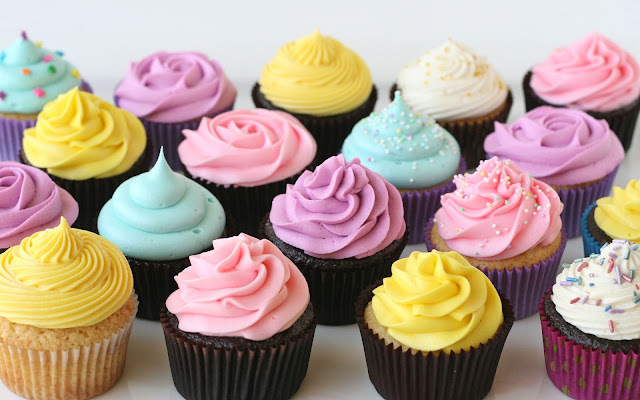 Your pastel cupcakes look divine. TBT Boya ve Dekorasyon: yıllardır konya duvar kağıtları konya tadilat ve dekorasyon alanında göstermiş olduğu çalışmalar neticesinde, başarı merdivenlerini hızla tırmanarak sektöründe tanınan ve söz sahibi firmalar arasında yer almıştır. Uzun yılların vermiş olduğu bilgi, birikim ve tecrübe ışığında bünyesine jotun boya ürünlerini de katarak konya jotun boya bayiliğini üstlenmiştir. Great video!! I’ve been looking for a good frosting recipe. Something that tastes good and has the right consistentsy. What are your suggestions? I have a question. 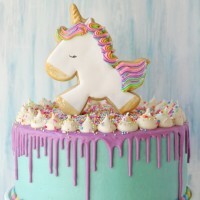 What tip did you use for each of the cupcakes that I saw on the picture? 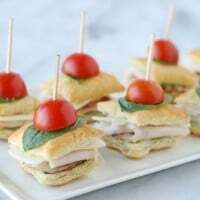 I’m trying to make them for my sisters grad party, and I want to make these for her. Please send me a email or something like that if you can. I need to know ASAP! The text below the second image in this post tell which tips I’ve used. The tips are (as pictured left to right) Large round tip, Open star (Wilton 1M), Closed star (Wilton 2D), French tip. The large round tip I used is about 1/2″ diameter and the French tip is about the same. Different companies sell slightly different sizes. I like using the biggest I can find, which is usually 1/2″-2/3″ opening. hello, there is placed a white board at the bottom, may i know what kind of this board for placing the floral cupcake? and can advise where i can buy it to home? THANK U FOR UR EASY TO FOLLOW INSTRUTIONS ..
our Agency Dubai Desi online Models Services provider. if you are in Dubai and you wnt meet with our Models just call us and visit our link.